Many people enjoy the flavor of pistachio nuts. These nuts grow on trees in warm climates, such as California, Texas and New Mexico. Although pistachio trees thrive in warm weather, they require an annual cold spell of approximately 1,000 hours to break dormancy. This rest period enables new growth in the spring. 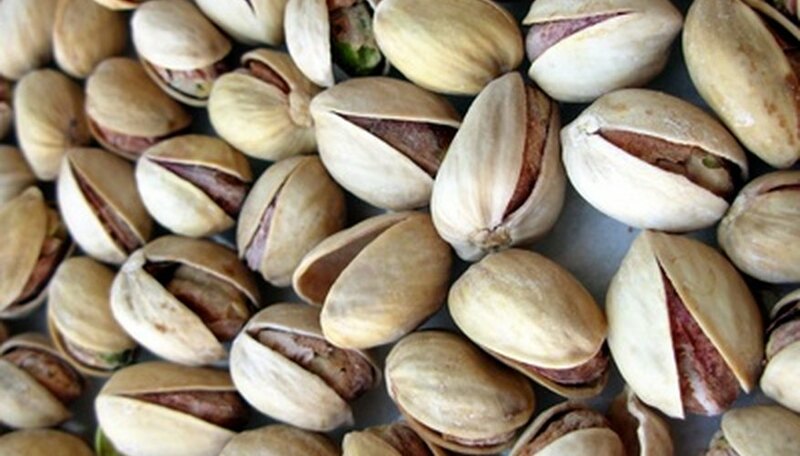 Plant some pistachio trees to produce homegrown nuts. Although quality nut production requires about 15 years of growth, many trees begin producing a few nuts 5 to 8 years after planting. Select a sunny location for your pistachio trees. Choose a location away from large trees and nearby structures that create shade. Avoid low areas of the landscape that retain water. Choose an area that contains enough space for the number of trees you intend to grow. Plant pistachio trees 20 feet apart. Loosen the soil in your chosen planting site with a plow. Break apart the topsoil to provide a loose medium for the roots of your trees. Pull out any existing stumps or shrubs. Determine how many trees you plan to plant. Select one male tree to pollinate between 8 and 10 female pistachio trees. Choose plants in biodegradable containers to avoid damaging this tree’s sensitive root system during transplantation. Dig holes in your loosened soil with a garden shovel. Make the holes equal distances apart, allowing about 20 feet between each one. Dig deep enough to place the surface of the rootball even with the surrounding soil. Plant your male trees towards the center of the planting area, surrounded by the female species. In areas with predictable wind direction, plant your male trees upwind of the female trees to encourage good pollination. Soak the soil around your new trees’ roots immediately after planting. Allow the soil to dry out between each watering. These trees require infrequent soakings. Even though these trees tolerate occasional droughts, they prefer periodic, deep watering. Fertilize your pistachio trees to encourage healthy growth and nut production. Pistachio trees require adequate amounts of nitrogen, potassium and phosphorus. Apply fertilizers designed for use on pistachio trees according the manufacturer’s directions. Spray your trees a few times a year with minor elements, such as boron, zinc and copper. Purchase disease-resistant specimens to avoid unnecessary plant loss.